There is more to do with eggs than making colorful (edible) art for Easter celebrations. Eggs are fascinating! They’re amazing! You might even say they are eggs-ellent. Take a tour around these websites and rediscover the most common symbol of Easter! 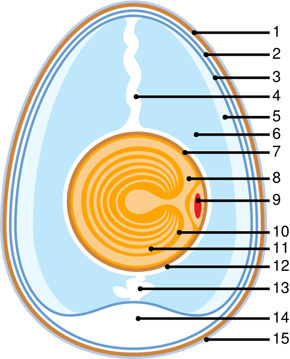 Begin the tour with the anatomy of a chicken egg. Do you know what the chalaza or the albumen is in an egg? Find out with this simple to understand diagram accompanied by in-depth explanations of each part at Imagination Station. After learning a little bit about what’s inside that egg, you may want to try your hand at magic! I mean, science… by making the eggshell disappear, making the egg become unbreakable, or shrinking an egg! You can find simple science eggs-periments like that, right here on Science Sparks. Try some of these recipes that combine science & cooking in the Kitchen Lab! From Ancient China & India, European Middle Ages and the Americas.. discover the history of eggs and their impact on humans! Finally, when there’s nothing left but eggshells, what do you do with them? Throw them in your compost, use them as seed starter pots, even eat them! Visit the Prairie Homestead for a list of incredible uses for eggshells. Quick Boat Tour in Okefenokee Swamp, Georgia! #GoalZero Lighthouse Solar Kit Daily #Giveaway for a whole month!